Please support our research with a tax-deductible contribution today. Junior U.S. Senator Marco Rubio has just thrown his hat into the ring and announced his bid for the presidency. Since Rubio made a point of discussing, at length, his religious beliefs in his 2012 memoir “An American Son: A Memoir”, it seems fair to have a look. Following his announcement, LGBT rights media have showcased Rubio’s lengthy record of anti-gay statements and rhetoric (see 1, 2) but there’s a broader pattern. Among Rubio’s two main religious influences, Catholic Church doctrine is a matter of public record. But an investigation of Rubio’s Miami Baptist megachurch reveals, notably, an anti-homosexual hiring policy, the promotion of demonology and exorcism, Young Earth creationism, and denial of evolution. Marco Rubio’s walk with God has been meandering and, some might say, fickle. As a child Rubio, who was baptized Catholic, made a brief but fervent conversion to Mormonism. His switch to the Church of the Latter Day Saints lasted three years. As an adult, from 2000 to 2004 Rubio took a detour from his Catholic roots to exclusively attend Miami’s Christ Fellowship, a Southern Baptist megachurch to which Rubio has given at least $50,000. Now straddling both Christ Fellowship and the Catholic Church, Marco Rubio seems positioned to appeal both to conservative Catholics but also the anti-LGBT, demon-casting, creationist segment of the Protestant evangelical right. Though he’s now primarily and “firmly” Catholic, Rubio has recently told Religion News Service reporter Sarah Pulliam-Bailey that he has “maintained the relationship with Christ Fellowship” and often attends services at the church. 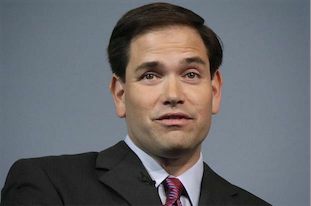 During his Protestant years, Rubio revealed in his 2012 memoir, he nonetheless “craved, literally, the Most Blessed Sacrament, Holy Communion” (of the Catholic Church.) So, the rising GOP star found a practical, buffet-style solution. Rubio divulged that on Saturday nights he brings his family to worship at Christ Fellowship, and on Sunday the Rubio family attends St. Louis Catholic Church. In early 2012, Rubio’s official spokesperson Alex Conant told CNN that Marco Rubio “enjoys the sermons and the excellent children’s ministry at Christ Fellowship and still attends often”. 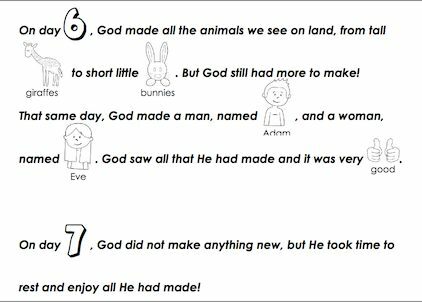 The Christ Fellowship children’s ministry makes extensive use of creationist teaching material. Such ever present “evil desires” can lead to addiction. Accordingly, Christ Fellowship has a men’s group that helps those so-afflicted to fight their “predisposition to [sexual] addiction”, a “Men’s Sexual Integrity” group that meets every Thursday at 7 PM. As “Pastor Rick” recounted in his “Demon Possession” sermon, one day in the Fall of 2011 he met a man en route to one of Christ Fellowship’s small groups, an individual who had “been into Satan worship” and “all sorts of occultic religions” and who had “participated in the vilest sexual stuff you can imagine”. Does Marco Rubio believe in the exorcism, of gay demons or other allegedly malevolent spirits ? If so, he wouldn’t be out of step with the Catholic Church – which has joined in boosting the resurgence of the practice. Nor would Rubio be out of step with a demographic he might hope that his relative youth would draw towards the Republican ticket in the 2016 election; as a 2012 Public Policy Polling survey revealed, 63 percent of young Americans age 18-29 now believe it is “possible for people to be possessed by demons”. And it’s a growing trend, showed the PPP survey. The age group least likely to believe in demon possession were Americans 65 and older. Among that age group, only 44% believed in demon possession. “Sen. Marco Rubio (R-Fla.) will speak at a fundraising dinner this week honoring Mat Staver, an ardent anti-gay activist who has defended Malawi’s ban on homosexuality. Staver is suing New Jersey GOP Gov. Chris Christie for signing a law banning gay-to-straight conversion therapy, and has said that teaching gay rights in schools is tantamount to “sexual assault“.